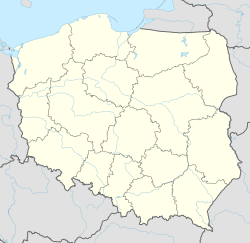 Ciechocinek [t͡ɕɛxɔˈt͡ɕinɛk] (German: 1939-45 Hermannsbad) is a spa town in Kuyavian-Pomeranian Voivodeship, Poland, located on the Vistula River about 10 kilometres (6.2 mi) east of Aleksandrów Kujawski and 20 kilometres (12 mi) south-east of the city of Toruń. Wikimedia Commons has media related to Ciechocinek. Ciechocinek is known for its unique[clarification needed] 'saline graduation towers'. Experts have considered the local saline springs to be of extreme value and named the thermal spring no. 14 "a wonder of nature". The therapeutic qualities of these springs are directed toward curing cardiovascular, respiratory, orthopedic, traumatic, rheumatic, nervous system and women's diseases. Ciechocinek was part of the Polish-Lithuanian Commonwealth until 1793, and was for some time part of Prussia until 1807, when it was transferred to the Russian Empire, from 1844 on as part of Warsaw Governorate. Following the invasion of Poland at the beginning of the Second World War, Ciechocinek was occupied by Nazi Germany on 12 September 1939 and on 26 September incorporated into the Reichsgau Wartheland as part of the district/county (kreis) of Hermannsbad (1941-1945). During the war the town functioned as a military hospital and also as a health resort for German citizens. In early 2018, a Tesla Supercharger opened, making it the fourth opened in Poland. "Blog of tourism about Kujawy" (in English and German). This Aleksandrów County location article is a stub. You can help Wikipedia by expanding it.